Schinoussa is a tiny gem that lies south of Naxos island, in the Small Cyclades group, near to Iraklia and Koufonisia. Schinoussa has been inhabited since antiquity and the origin of its name is debatable. Some argue that it is named after a bushy plant called lentisk (“schino” in Greek), though others argue that it is named after a Venetian nobleman called Schinoza that ruled the island during the Venetian Occupation. Its land area is less than 10 square kilometers and around 260 people live there permanently. It consists of three villages: Hora, Messaria and Mersini. In the Aegean Sea, Schinoussa’s port is considered to be one of the best shelters for vessels. In case you don’t have your own vessel, you can easily arrive there by ferry; it is only 7-9 hours away from the port of Piraeus. Schinoussa’s terrain is smooth and perfect for those who wish to go on hiking. You can enjoy a lovely hike and discover its immaculate and wild landscape. You can also take leisurely strolls with your partner through its picturesque streets that are designed according to the Cycladic architecture. Its cobbled, labyrinth-like streets that are surrounded by white houses create a magnificent scenery for all those who seek to have relaxing and romantic vacations. What else to do? Relax and enjoy its divine nature! The serenity of this tiny island can calm almost everyone. You should really visit the Folklore Museum of Schinoussa and admire the traditional costumes and daily tools and utensils that people of Schinoussa used, especially in agriculture and fishing. In this island, there are also ancient Greek and Roman ruins and a small castle that was built during Medieval times. There are also two caves situated near the port. According to the Folklore tradition, the “Spilia tou Pirati” (literally: The Pirate’s Cave) is named after a pirate that attempted to steal a church. This pirate, though, never managed to do so. 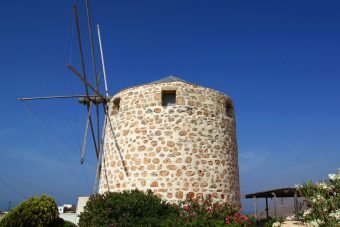 Lastly, this island has three beautiful and traditional mills; the first is located in the area of Vardies, the second in Messaria and the third in Tsigouri. You should really eat “meletinia”. “Meletinia” are little cheese pies filled with a Greek cheese called “mizithra” (they are also made by egg and sugar). You can also enjoy tasteful pasta with lobster and roast lamb with rice. Try and even buy kefalotyri cheese, kopanisti cheese and fava beans. It worth mentioning that their prices are reasonable. This jewel is mostly known for its amazingly beautiful beaches, which are mostly accessible on foot. It numbers plenty of unspoilt beaches such as the cosmopolitan Tsigouri, the immaculate beach of Psili Ammos and the beach of Lioliou which is ideal for families due to its shallow and crystal waters. 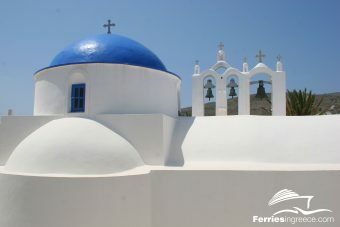 Visitors can also go in Naxos and Amorgos for a day trip, if they wish, by local ferry. It’s really close.